When interviewing Danny Trejo on set during the filming of Death Race 2, he told me how excited he was in anticipation of Machete. His cousin Robert Rodriguez has been wanting to make this movie with him for years, and when they made the fake Machete trailer for the Death Proof and Planet Terror Grindhouse flicks, they put things in motion to get it done. 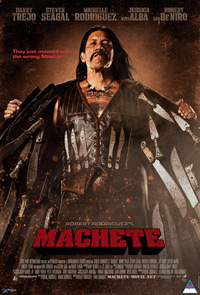 Machete is a Mexican Federale cop who'd been viciously ambushed by a top bad guy. Years later he is down on his luck just across the border in the States, working odd jobs. He is picked up by a mysterious man who offers him a handsome amount of money to assassinate the prospective new president of the USA. But, he is framed. Together with an underground movement he takes on the bad guys whose influence run deep. Violent, bloody, excitingly over the top and one hell of a cool ride, Machete blows all the big budget pretty-boy action movies out of the water (and addresses the other side of the illegal Mexican immigrant issue). The DVD release features a commentary track and deleted scenes.